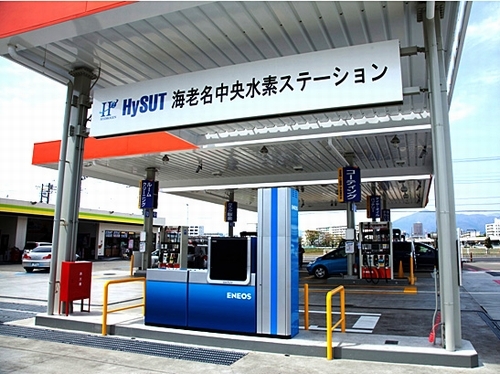 The New Energy and Industrial Technology Development Organization (NEDO) announced on April 19, 2013, that it opened Japan's first hydrogen refueling station incorporated in a retail gasoline station in Kanagawa Prefecture, jointly with JX Nippon Oil & Energy Corp., a major Japanese oil wholesale company, and the Research Association of Hydrogen Supply Utilization Technology (HySUT), which has been demonstrating hydrogen supply infrastructure. A revision of the general high pressure gas safety regulations made in November 2012 now allows the construction of high-pressure hydrogen stations in urban areas. Expecting the mass supply of hydrogen along with popularization of fuel cell vehicles (FCV), as with the supply chains of gasoline, large amounts of hydrogen will be efficiently produced at oil refineries and transported to stations, then stockpiled in high pressure gas storage tanks. This station will be positioned as a consistent demonstration site for selection of future sites, design, specifications of equipment, the permitting process and construction of commercial operations. NEDO will also obtain demonstration data from the hydrogen supply stations built in Toyota Ecoful Town (Low-carbon Society Model District in Toyota City) and Kaminokura (Nagoya City) in Aichi Prefecture, and use these data for future construction of infrastructure.